REFLECT: The Technology RoundTable is an initiative by Governance Now to bring on board stakeholders in e-governance to discuss on a theme. Every fortnight, we invite experts, practitioners and service providers to jam on a topic which impacts e-governance in the country. 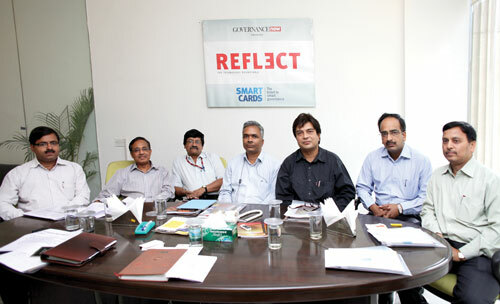 Thus on April 13, a roundtable was organised in our office on “Smart Cards: the ticket to Smart Governance”. At the high table were SK Sinha, senior technical director, national informatics centre (NIC); SK Chakrabarti, deputy director general, NPR; DL Narayana, general manager, NICSI; Dheeraj Jain, deputy director, office of registrar general and census commissioner; Deepak Gupta, deputy director, office of registrar general and census commissioner; Sanjeev Vij, director, Enterprise Solution Sales (e-Governance), HCL Infosystems; and Anurag Ashok, founder, e-Smart Systems Pvt Ltd. The roundtable was moderated by Samir Sachdeva. Smart cards are becoming more and more popular, be it the driving licence, registration certificate for vehicles or Metro cards. These cards are obviously great facilitators for making the government-citizen interaction smooth, but their usage faces two challenges: vendor lock-in (that is, how to keep the card in business after the government department’s contract with a particular private service provider is over) and inter-operability (that is, how to make a single card useful for a variety of services). These issues have been addressed to an extent with the adoption of SCOSTA (Smart Card Operating System for Transport Application). The standards, made for a transport application, are generic, can be deployed for any kind of card, and are accepted internationally as well.